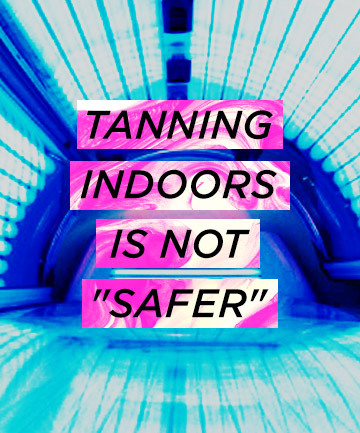 Tanning Indoors Is More Dangerous Than Tanning Outdoors One of the most common spiels you'll hear at the tanning salon is that if you're going to tan, it's "smarter" to do so in a bed as opposed to outdoors. Tanning salon employees like Heather Carrillo, who worked at a salon for a year and a half, say they are taught in their "Smart-Tan Certification" to "never say indoor tanning is 'safe' [but] to say it is 'smart.' Obviously getting a tan is not safe, so the selling point is that in a bed you can monitor the exact amount of exposure as opposed to tanning outside where the UV percentages change every day." So is this true? Is tanning indoors smarter that outdoors due to the "controlled environment" of a bed? David E. Bank, MD, a dermatologist and founding member of The Skin Cancer Foundation, says no. In fact, he maintains that it's quite the opposite -- tanning indoors is actually more dangerous to the health of your skin because "you're getting a much higher concentration of the longer wavelength UVA, which damages more deeply into the skin" than being out in the sun. And research backs him up. "Frequent tanners using new, high-pressure sunlamps may receive as much as 12 times the annual UVA dose compared to the dose they receive from sun exposure" and are "74 percent more likely to develop melanoma than those who have never tanned indoors," says The Skin Cancer Foundation. UGH! I hate reading articles like this. I love being tan and love laying in that tanning bed for 15 minutes of relaxing me time. But I know that it is sucha bad thing to do! Why? Why are all the good things we love so bad for us?!?! 75% of Americans have a vitamin D deficiency because of stupid articles like this! A lack of vitamin D, sunburns, spray tans and sunscreen all cause cancer. People really need to start thinking for themselves! Ha!!!! Most of this information is CRAP and the last slide about spray tanning proves it!! Spray tanning involves a compound called DHA which is a derivitave from sugar cane. It causes an oxidization affect with the top layer of dead skin. It does not in ANY way stimulate the production of melanin!! Research both sides before you throw your opinion in the ring! Don't be fooled into believing that Cancer societies and Dermatologists aren't being funded BIG TIME by sunscreen manufacturers! But go ahead, drive the fear while telling people it's safe to slather on chemical laden sunscreens! Double standard? I think so! Wow, what a fun read! I'm going to make my friends read this!